Laminated glass is a safety glass that is created by sandwiching two or more sheets of standard annealed glass together around layers of transparent plastic laminate. If the outer layers of glass are broken, the laminate layer will hold the glass firmly in place, which makes for a much safer product. For this reason, laminated glass is frequently used in applications where there is a high risk of injury should a breakage occur. So car windscreens and architectural glazing such as rooflights, curtainwalls, glass partitions or glass doors can have laminated glass specified as a standard safety measure. Two types of transparent laminate interlayer are typically used to form laminated glass; either polyvinyl butryl (PVB) or ethylene-vinyl acetate (EVA). The glass and laminate layer are sandwiched together and bonded firmly together using a combination of pressure rollers and heat. This process removes the air from between the layers and fuses the three layers together. 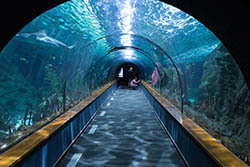 The benefits of laminated glass are wide-ranging. Not only does it provide protection in the case of accidental breakage, for example in a car crash; depending on the thickness and type of the glass and laminate used, it can also provide sound insulation, protection from solar and UV rays, heat and fire resistance, blast resistance and can even be bullet-proof. So you will find laminated glass in places such as recording studios, police vehicles, banks, jewellery shops, aquariums, embassies and petrol stations. It can also be used for decorative purposes around the home, by including a tinted interlayer to colour the glass. Coloured glass splashbacks in kitchens or bathrooms will generally be made of laminated glass. One of the more recent advancements in laminated glass has been the development of LCD electrochromic or ‘smart’ glass. This clever technology uses an opaque layer of LCD film between laminate sheets. The film can then have an electric current passed through it, which will switch it from opaque to transparent. Smart glass is widely used in applications such as glass partitions in offices, where it can be used to create privacy when required. It is also useful in buildings where it is impractical or undesirable to have curtains or blinds at a window, reducing sun glare or again providing privacy when required. Laminated glass is an incredibly valuable and beneficial material that is used widely throughout the construction industry. Tufwell Glass are industry leaders in the production and supply of glass and can offer clients a range of products as well as expert advice. 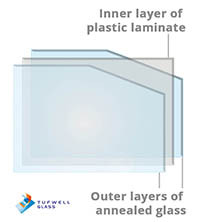 Thanks to Tufwell’s continual investment in the company, we will soon be able to manufacture our own laminated glass to order. Our new laminating equipment will be installed in the coming month. Get in touch if you would like further information about Tufwell Glass’s services or products.